The same rules of your gym can help you at work. (CareerBuilder.com) -- The horde of new gym-goers crowding your local health club is a sure sign of a new year. Blame it on the countless magazine covers touting "a new year, a new you." We hope we don't lose enthusiasm after a few weeks and end up stuck with a membership we never use. If you find yourself fading, remember that you can multitask at the gym and improve multiple aspects of your life. While you're running on the treadmill or doing bench presses, look around for some tips on how to manage your career. Gym rule No. 1: Don't drop the weights. Work equivalent: Don't tell everyone how stressed you are. Why? Dropped weights can get damaged or even break, plus the floor gets torn up. If you need assistance, get a spotter. At work, everyone is busy and no one will have sympathy if you spend more time making a show of your to-do list than actually working. If you need help getting things done, see if someone can assist you. Otherwise you're damaging your reputation. Gym rule No. 2: Keep a log. Work equivalent: Record your accomplishments. Why? Studies have proved that people see better results when they track what exercises they perform, how much weight they use and how many repetitions they perform. When you've been in the same job for a while, you begin to forget how much you've accomplished. If you regularly note your daily tasks, you'll gradually see the list get longer. By the time you're ready for a new job, you'll have an impressive list of accomplishments to brag about. Gym rule No. 3: Arrive to class on time. Work equivalent: Don't be late to meetings (or other events). Why? When latecomers walk in 10 minutes after class started, they sneak across the room trying to be inconspicuous, but they end up disrupting everyone. You lose track of the instructor's directions and all that time spent situating yourself is ruined when the tardy party asks if you can just scoot over a bit. You should arrive to work on time, too, and you know that. Too often workers forget that punctuality is just as or even more important for meetings. Everyone notices when you walk in late, which means they're wondering why they managed to adjust their schedule but you were too important to show the same courtesy. Late arrivals might cause a late start and then no one is happy with you. Gym rule No. 4: Don't hog the equipment. Work equivalent: Be considerate of your colleagues. Why? The man who decides to walk on the treadmill for two hours or the woman who parks herself at the abs machine for 10 sets are perhaps the most annoying people in the gym. They inconvenience you and everyone else. Just as the gym isn't your private fitness center, the workplace isn't your home office. Don't get on speakerphone if it means 30 co-workers will end up hearing your conversation. Don't send so many files to the printer that no one else can use it for an hour. Don't throw your half-eaten salmon from lunch in your trash can -- take it to the break room. In short, be the kind of co-worker with whom you want to work. Gym rule No. 5: Change up the routine. Work equivalent: Broaden your skill set. Why? 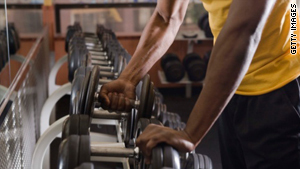 Performing the same exercise routine every time you go to the gym will eventually lead you to stop seeing gains. You'll stay in shape, but you won't lose weight or build muscle. Your body gets used to doing the same thing and you'll hit a plateau. If you've held the same position for the last three years and everything you're doing now you learned in your first week, you need to liven things up. Look into seminars, training courses, professional organizations and other opportunities at your company and elsewhere. New skills will make you a better employee (either here or for a future employer) and will prevent you from getting bored. Gym rule No. 6: Wipe down the equipment. Work equivalent: Maintain good relationships. Why? Do you want to use a weight bench if you see a big pool of sweat? No, because it's gross. If every meeting ends with you screaming at someone or you always resign from jobs by telling the boss just how much you hate her, you're not doing anyone any favors. The moment might have passed, but your reputation and the negative feelings you leave behind won't be forgotten. They might even resurface when a potential employer performs a reference check and decides not to hire you. Gym rule No. 7: Use a spotter. Work equivalent: Know when to ask for help. Why? Serious gym-goers, especially the ones bench pressing twice their weight, know they need to push themselves hard. They also know how dangerous that can be and they won't want a face full of weights when their arms get shaky. Work can be overwhelming. Maybe you're expected to do much more than is humanly possible or perhaps you voluntarily took on a task that has grown into something more challenging than you expected. If you can recognize when you need assistance -- either a person to help you out or an extended deadline -- you can avoid professional disaster. Your boss will prefer your initiative to you showing up on the due date to say, "By the way, I'm not done." Gym rule No. 8. Know your goals. Work equivalent: Know what you're working toward. Why? If you show up to the gym and have no idea if you want to lose weight, build muscle or condition for a sport, you're probably not going to achieve much of anything. Whether you have one goal or five, if you can identify what you want to accomplish, you can find out the best ways to do it. Your career isn't that different. Professional goals can be less concrete than gym goals, and they usually take longer to achieve. But mindlessly going through your career without any clue where you want to end up is a sure-fire way to end up doing the same thing for 20 years. Not everyone needs to aim to be CEO or one of the head honchos. A goal can be as simple as improving your previous sales record. Gym rule No. 9: Don't wear stinky clothes or your junior-high gym shorts. Why? No matter where you are, stinky clothes are never appropriate. But more importantly, you need to think about what image you're projecting. Your work appearance should align with your company's image and your role.